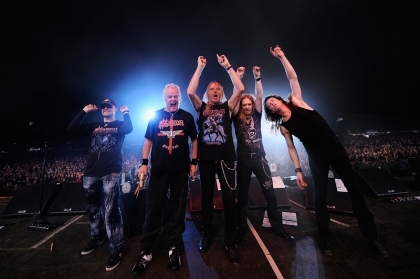 Never tired of the road, British metal veterans Saxon will be returning to the UK for the second time this year with a string of live shows in December. Lead vocalist and main man Biff Byford keeps leading the pack and mesmerizing audiences with his performances, never shy of energy, drive and enthusiasm. "It doesn't matter if we are playing for 90,000 people or 2000 people, as long as they are there to see us play, we are happy," Byford recently commented. Paul Quinn and Doug Scarratt on guitars, Nibbs Carter on bass and Nigel Glockler on drums complete the current line-up. Saxon will be playing unforgettable classics and more recent material from Call to Arms. Dates as follows: Support is Hammerfall for all shows. Saxon formed in 1976 in Barnsley, Yorkshire, and went on to lead the New Wave of British Heavy Metal. They had 8 Top 40 albums in the UK in the 1980s - including 4 Top 10 - plus an impressive amount of Top 20 singles. Saxon have sold more than 13 million albums worldwide and heavily influenced bands such as Metallica, Megadeth, Sodom and Running Wild. Live performances have always been one of the biggest strengths for the band, which is renowned as one of the best heavy metal live acts Britain ever fathered.